Colorescience Sunforgettable Very Water Resistant Powder Sun Protection SPF 50 0.21 oz. 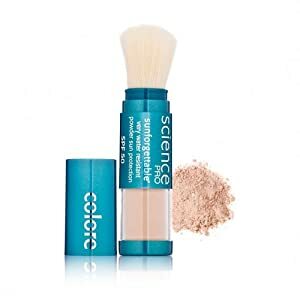 Colorescience Sunforgettable Extremely Water Resistant Powder Sun Protection SPF 50 (formerly Sunforgettable Mineral Powder Brush SPF 50 Matte) supplies large protection to even out your skin tone and safeguard versus the sun'' s damaging rays. Red seaweed extract, loaded with minerals, vitamins and amino acids, keep the skin healthy and radiant. The user friendly dispensing brush makes re-application simple and keeps powder protect to avoid messes inside your bag or makeup bag. Medium is ideal for medium complexion.